In the business-world, they are loved and hated at the same time. Reports with a hundred pages each, in very short intervals. They can overwhelm you. But with the right granularity, you can get insights you won't be able to obtain in a different way. I've implemented automated reports for kiesler.at. In the first instance, there will be three reports sent as one new thread in the forum. Every moth, this report will be generated automatically by the user "system". Googlebot the well-known crawler. A while ago, a new beta program of Google started. Google Sitemaps. There, Webmasters can upload sitemaps of their sites. Thus, pages not even linked properly can be made accessible to Googlebot easier. Uploading happens with a well-defined XML format, which is specified on the Google Sitemaps homepage. I made a little php program to generate such sitemaps automatically out of the installation of a phpWebSite. You can even specify multiple phpWebSites on the same server and let the program generate a site map for each. So you've stumbled across them. Open Source CMS systems. And are puzzled. What exactly can they do, how can they help me? Why shouldn't I simply go to a consultant, pay a bit of money and let him/her decide, what to use? Well, you could of course do that. Or you could inform yourself prior to buying service or doing a site by yourself. I'd like to help you here by providing a collection of some of my favourite phpWebSite installations. You can see there, how they are used, how they look like, how they work. Some people fancy a multi-languaged phpWebSite. Some tried out to simply set up multiple sites. Others experimented with branching. There's even a rather underused dynamic translation built into phpWebSite for just that purpose. I've tried to set up a multi-language site and was successfull. A little bit of programming skills is almost all it takes to hack the modules you need to be able to hold multi-language content. If you have a lot of different phpWebSite installation, it can happen that you lose track of your hacks. To cope with this problem, I made a little module that detects a couple of well-known hacks and shows their installation status as a table. Usage is easy: Just boost it in and click the icon in the Control Panel. 0.1.1 includes fixes by Yves K�ndig. 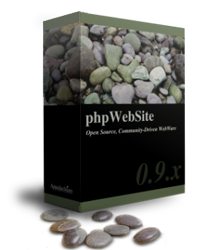 He fixed, amongst other thing, the support for phpWebSite installation with prefixed tables. Social Bookmarking seems to be "the next big thing" since Blogs right now. Always being one to look deeper into current trends, I've taken a closer look at Social Bookmarking systems also and enjoy them. They enable you to share your bookmarks. Not only amongst different PCs but also with a large community. And they help you get your bookmark list in shape by providing tags. That's where you come in. Do you like phpWebSite? Do you think, it should have more exposure? More and more people switch from regular static homepages to dynamic ones. The so called WCMS (web based content management systems) are very popular because of their ease of use and setup. One module you can see in about every WCMS, be it a stand-alone forum, a portal or even a blog, is a poll module. I've analyzed 49 sites running the phpWebSite WCMS. I've taken a look at how the site owners use the polls, especially what kind of questions they are polling and how successful they are in doing so. This is a small testpoll to find out, wether the phpWebSite poll module can handle images in questions as well. The answer to this question is yes, it can handle them perfectly. Common websites rely on external webmetric-analysis. How many people came on the site, what did they do, where did they go? The Visitors module took that idea and enhanced the statistics with data only a native application would be able to find out. Who was logged in and when? Which modules did he/she use? But Visitors is quite a bit away from being a full-fledged datamining tool. While it is possible to see which path a visitor on a certain site took right now there is no generic history analysis as of now. I've described some concepts during the past semesters Data Warehousing 2 lecture.